Before the Beatles or the Rolling Stones ever played a note, rock & roll was forever changed by the bespectacled kid from Texas. 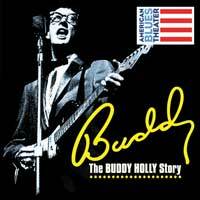 BUDDY tells the true story of Buddy Holly through his short yet spectacular career and features the classic songs "That'll be the Day," "Peggy Sue," The Big Bopper's "Chantilly Lace," Ritchie Valens' "La Bamba," plus many more. "...This is not the subtlest show you ever saw - that never has been the case. And the production rushes the ending, diluting the sense of loss. "Buddy" never needs shtick, it just needs truthful performances and the songs that people love. This one makes up for the overplayed and campy moments with a killer central performance, exuberant support from Deris and Lopez under the musical direction of Michael Mahler, a deft turn from Molly Hernandez as Buddy's wife, spirited small-space choreography from Jon Martinez and just a general spirit of inclusion, emotional investment and rockin' happiness. You'll have a blast." "...It's not hard to see why Alan Janes's 1989 jukebox musical charting the rapid rise and early death of seminal rock and roller Buddy Holly ran in London's West End for 14 years or why it has been produced all over the world. The show really rocks. Holly's high-spirited tunes are featured front and center, and if the band is even half good, it sells the show." "...And as the man behind the glasses, Zachary Stevenson is vocally spot-on and thoroughly charming. Though new to Chicago-this marks his stage debut in the city proper after understudying the suburban Paramount Theatre's Million Dollar Quartet last fall-Stevenson has made a cottage industry of Buddy Holly, having led more than 10 productions of this show throughout the U.S. and his native Canada. And it's frankly hard to imagine a better Buddy; Stevenson's all-in performance will stick with you and not fade away." "...It's a well-cast production, tight, crisp and fast-paced, directed by Lili-Anne Brown with musical direction by Michael Mahler. In cameo roles, Vasily Deris as the Big Bopper (a.k.a. J.P. Richardson) and Cisco Lopez as Ritchie Valens add generous dollops of style and charm. Historical accuracy gets massaged here and there, but the basic progression of events is right - Buddy's breakout from Lubbock, the sunburst eruption of his clear-voiced, curiously hiccupy sound with its driving rhythms, his first-date marriage proposal to Maria Elena Santiago (Molly Hernandez). It's great fun to watch Stevenson's Buddy rebel against one restraining hand of convention after another to forge the infectious style that was crying, waiting, hoping to be free." "...ABT Buddy is an exhilarating musical that keeps you engaged from beginning to end with outstanding performances and classic songs like "The Big Bopper's "Chantilly Lace," Ritchie Valens' "La Bamba," both Vasily Deris and Cisco Lopez were phenomenal in their performances. They had the audience up on their feet with joyful chaos because it was a such a crowd pleaser. You thought you were at a concert longing for an encore!" "...Every so often, a theater company finds the perfect actor to do that one play that they have thought about, but were afraid to take on. I think this is the case where American Blues Theater Company is concerned and the creative teams desire to bring back �Buddy- The Buddy Holly Story�. This is a play that I have seen over the years, perhaps as many as a half- dozen times, and while they all had solid musical talents, none brought out Buddy as he needed to be . That is until tonight! ABT�s powerful version of Alan Janes� story about the legendary Holly and is rise to fame is portrayed by newcomer to their company, Zachary Stevenson, who as it turns out may have been �born to play this role�. ( he has done over ten productions)." "...But it is the music that is of the essence here. Michael Mahler's music direction is sublime, and Stevenson's uncanny performance is backed throughout by the virtuosic playing of The Crickets, including bass player Shaun Whitley as Joe, drummer Kieran McCabe as Jerry, and Mahler on guitar as Tommy." "...In a joyous, melodic, dynamic story of one of music�s greatest songwriter/performers, Buddy Holly authentically springs to life in Zachary Stevenson�s excellent portrayal. Directed with flair and spirit by Lili-Anne Brown, with especially fine musical direction by Michael Mahler, Alan Janes� enjoyable biographic tune-fest is a definite hit. This production, particularly in its intimate setting, is a must-see. It features top-notch, multitalented triple-threats, performing a vast collection of familiar, toe-tapping hits from the 1950�s and is a proven audience favorite in Chicago. �Oh Boy!� is an understatement." "...Mahler�s magnificent music direction leads the creative team including Sarah E. Ross� well-thought-out sets complimented by Samantha C. Jones� period-perfect costume design. John Martinez�s finely executed choreography is an added plus." "...Zachary Stevenson as Buddy is a multitalented singer, guitarist and actor who has performed the Buddy Holly story and many other pop music productions like Ring of Fire and Million Dollar Quartet all over the U.S. and his native Canada. He also has been in 10 productions of Buddy. Not surprising then, he becomes Buddy on stage, with all the Buddy dance moves and hiccupy vocal style. In the finale rendition of Chuck Berry�s �Johnny B Goode,� Buddy dashes on stage playing his guitar behind his head." "...When performing the biography of a legend, how successful the show is depends on who plays the star. In this case, Zachary Stevenson who performed in Paramount�s �Million Dollar Quartet,� is spectacular." "...Times may have changed in the past sixty years, but they have not changed that much. Everyone is still looking for a sure thing and we've got one right here in Chicago on West Belmont - the explosive performance of Zachary Stevenson in the American Blues Theater revival of Buddy - The Buddy Holly Story at Stage 773." "...The cast skillfully tells this tale while also singing and playing various instruments. They were an engaging and energetic ensemble with many cast members seamlessly switching roles. Mahler also served as the show's musical director and, in the writer's opinion, was able to create an authentic sound."